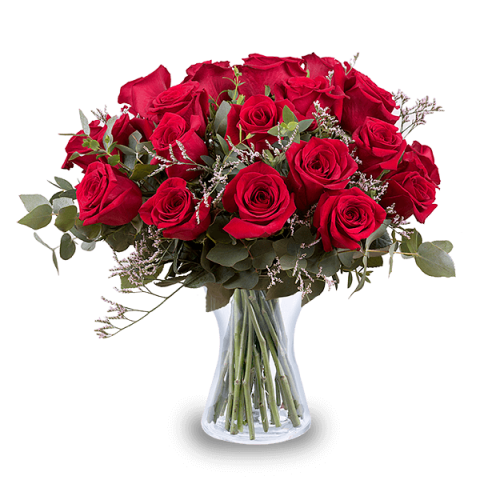 Send same day luxury flowers with ease today using FloraQueen’s international delivery service. If you want to give someone special a phenomenal surprise at the last minute, you don’t need to wait any longer. In this catalogue, you will find premium bouquets all with same day delivery available. With an express shipment of flowers to over 100 countries around the world. You can thank someone for an important favour, reignite the passion of your love, congratulate someone or make your partner feel special with a luxury bouquet. Roses are the main attraction of this deluxe selection, especially our opulent red rose bouquets. These spectacular arrangements and the premium quality of the flowers will render the recipient speechless. With same day delivery you can truly make the surprise a spontaneous one. Don’t miss out on the opportunity to make your premium gift that little bit more luxurious. We have lots of small ways available to make your bouquet even more extravagant and spontaneous. For a recipient with a sweet tooth you can make a selection from our sumptuous boxes of chocolate and assorted candy. If you’re trying to communicate a warm loving message you could also select one of our premium plush toys to make your surprise gift extra cute. It needn't matter how far away your recipient is, the luxury of premium flowers can arrive to them wherever they are living. We work with a network of expert local florists all across the globe and this allows us to offer not only same day delivery in many locations but also 7 days freshness guaranteed. It is easy to send luxury flowers to someone special today and all it takes is a few clicks.